Kalandra Jane - Millinery and Musings! : New Guinea Pigs! Apologies to you all for not blogging for a few weeks, by the end of the year I was just feeling totally burnt out and rubbish, and really didn't have anything to write about. Sales in the run up to Christmas were terrible, I was feeling low and generally stagnant, so took a few weeks to just relax and spend some time with Aerospace boyfriend and not think too much about bills, business or anything else really. I'm happy to say that sales at Kalandra Jane Designs have now picked up and are going well, I've got some fabulous custom projects in the works and am also planning several events, stalls and photoshoots in the next couple of months. Sadly on December 19th my guinea pig, Bela Lugosi passed away in my arms as we rushed him to the emergency vet at 6am. I'd had him over five years, so he was reasonably old, but his health suddenly took a dive and he started to lose weight rapidly one day, a few weeks after being separated from his friend, Mr. Sprout. Sprout had to have an operation to remove a facial tumour and Bela was doing more harm than good by trying to groom the stitched wound. We put the boys back in together once the stitches were removed, and they'd had a great evening bonding. I couldn't sleep that night, and when I checked the cage Bela was lying on his side gasping, with Sprout guarding him. I wasn't going to get another pig, but as soon as Bela was gone Sprout immediately began this pining behaviour too, losing weight through not eating and inactivity. A friend had some 11-week old baby males ready to go, and on Christmas day at my mum's they were waiting for me. Here are my boys together, Victor, Mr. Sprout and Igor. We buried Bela in the garden and placed some bluebell bulbs on top. Sprout's weight has now gone back up, surpassing even his pre-op weight. The new boys are very timid, but they've all bonded well as a group. Awww so sorry to hear about your little Bela Lugosi. It's so sad when you lose them. I recently lost one of my ratties and ended up adopting some babies for the other one left behind. 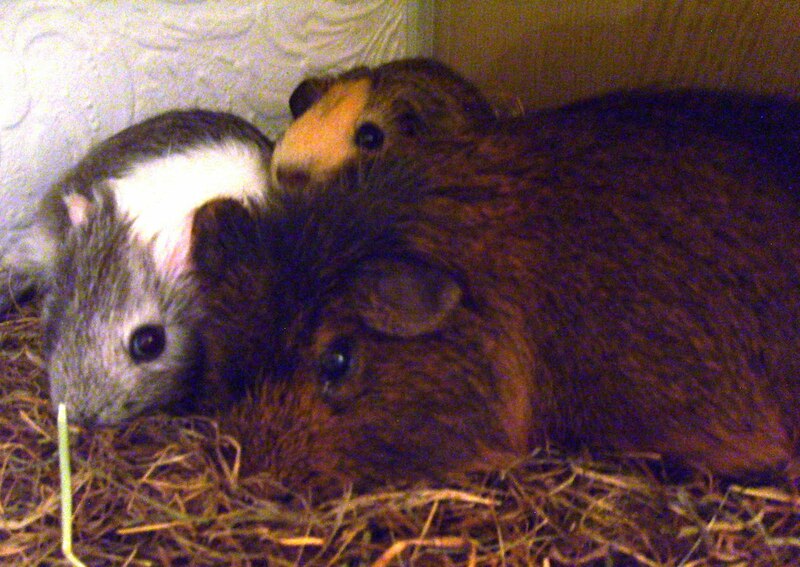 I love the cute noise that guineas make!! I'm so sorry about your sweet Bela. Guinea pigs are just so lovely and so fragile at the same time. Bless him. I'm glad that Mr. Sprout is doing better though. Congrats on your new babies!